There are an estimated 12 million blind people in India with most cases arising from treatable or preventable causes such as cataracts. In a developing country with limited resources government alone cannot meet health needs of all the poor and the challenges are to make the service accessible, affordable and with high quality. Aravind is the world’s biggest eye-hospital chain, based in India founded in 1976. Its core principle is that the hospital must provide services to the rich and poor alike, yet be financially self-supporting. It treats over 1.7 million patients each year, two-thirds of them for free. There are separate facilities for paying and non-paying patients and it is up to the patient to choose where to get the care. The fee based service can include fancy meals or air-conditioned rooms and the paying customers pay well above costs to cover the costs for subsidized and free services. The free or subsidized services are made very cost efficient by proving only the basic facilities that enact a process of social self-selection and create a hurdle for those who can afford to pay to demand free treatment. To maintain the quality of the care, the same doctors rotate to deal with both paying and non-paying patients. Aravind uses community partners and eye camps to access the poor, something that creates a huge demand for its services. Aravind’s business model is based on the high volumes generated and a surgeon in Aravind performs more than 2000 cataract surgeries a year which is 5 times the number performed by an average Indian ophthalmologist. 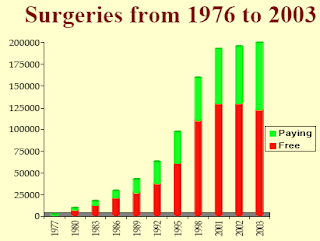 The large number of performed surgeries creates an expertise and reputation which has lead to Aravind becoming a training center for ophthalmic professionals and trainees. I really like your post and i love the business model as it is described. It seems that it can help a lot of less fortunate people. Yet I would not call it a freemium model. rather I would call an example of cross subsidizing. In the same way as when companies preform pro bono work or create a foundation. within law firms I think it is easy to illustrate the difference. 1 Especially in some parts of the world, there is a tradition for law firms to preform pro bono work. Where they do not charge anything. - I see this as a way to support a course or better the image of the company. As i see it there are several specific points of difference. what do you think ? Thanks for your comment Peter I know it's in your field! I agree with you that it's not a pure freemium model. However, I would argue that the Freemium Business model is a cross subsidizing model, as paying members, users or patients cover the costs for both paying and non-paying ones. Aravind offers a basic service for free and charge for premium value propositions such as more convenience, service and support, hence free + premium. However, I agree with you in the sense that the objective with the free patients is not to generate a large base of patients to convert into paying ones. But it is important to understand that the large base of patients has a value and is not purely a pro-bono activity. Providing the services for free has made Aravind a high volume business, forcing extremely efficient processes and giving doctors more practice, hence increasing expertise and skills. This has made Aravind an international training centre for ophthalmic professionals and trainees. You might be right, the subject can be understood in several ways form the article. 1 They offer a free surgery to everybody and then give patients the possibility to buy extras. 2 They set the price of the surgery according to the economic means of the patient. So the poor pay nothing and those better of pay. As I understand the article, it is the latter. Which i would not call a freemium, since it does not offer a free product to everyone. Yet I am not sure from the brief description. So just like the Internet services that provids freemium services, Aravind must create great value for the premium version, so patients who can pay, chose to pay.